The Ohio House passed a bill to allow hunting for some game species. The legislation that would permit the use of suppressors while hunting white-tailed deer, rabbits, squirrels and other game. The suppressors would need to be legal and registered with the ATF. The ATF permits individuals, Trusts, and business entities to apply for a $200 Tax Stamp to purchase and be in possession of a suppressor or silencer. 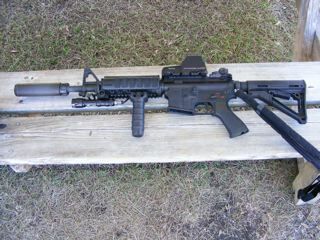 While a suppressor reduces the noise it does not make a gun silent. The Ohio bill would require that hunters who want to use a suppressor must submit to a background check and complete an application. Once the bill is approved the Ohio Senate it can be sent to the Governor for his signature. We will update you with progress on this bill as we learn about its status. Ohio Gun Trust- Ohio (OH) What NFA Firearms can I own? In Ohio a NFA Trust or Gun Trusts can own all types of firearms including those regulated by the NFA. Each state can impose additional restrictions on the sale, purchase, and transfer of Title II firearms – (Those sold by FFLs with a Class 3 SOT) in addition to the compliance that is required with the National Firearms Act. A Castle Doctrine (also known as a Castle Law or a Defense of Habitation Law) is an American legal concept derived from English Common Law, which designates one’s place of residence, or any place legally occupied, as a place in which one enjoys protection from illegal trespassing and violent attack. Ohio R.C. § 2901.05(C)(2), (3). It then goes on to give a person the legal right to use deadly force to defend that place (his/her “castle”), or any other innocent persons legally inside it, from violent attack or an intrusion which may lead to violent attack. Ohio R.C. §2901.05(B)(1), Ohio R.C §2901.09(B). The legal effect of the Castle Doctine is to protect the homeowner from criminal or civil suit resulting from the use of deadly force which actually results in death.